Connected Horse facilitator training is offered at various barns and therapeutic equine centers throughout the country. The training program offers people interested in this work a unique opportunity to learn about facilitating equine assisted activities for people living with mild cognitive impairment or early stage dementia and their care partners. 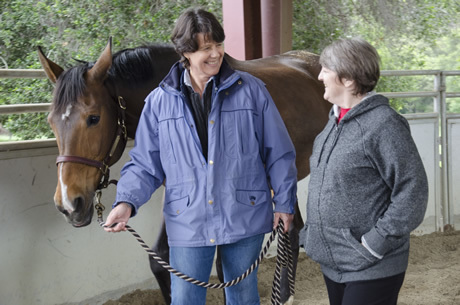 The curriculum is based on the Connected Horse research currently being conducted in collaboration with the UC Davis School of Medicine, Alzheimer's Disease Center and the School of Veterinary Center, Center for Equine Health. Space is limited. Contact us today! Please contact us if you are interested in more information about our facilitator training programs.